I am lending my time to help out with a spirit puzzle. That is, with a message that is meant to be simple to understand but is out of my league in terms of my limited experience. I seek your help with this. A disclaimer I feel compelled to include is that I am not assuming this is 100% veritable, but it serves as an exercise and I am seeing that it can polish skills working with the spirits. It so happens that there is an image a spirit drew. Can you enlist your minds and spirit connections to help out with the puzzle? Leelahel wrote: “It sounds like it's sacred geometry. My intuition tells me that it tells you with this its source or how to reach it, and I get the feeling the spirit is not native to Earth as well." Take out one circle from the diagram. The user did not specify which one to take out. Leelahel wrote: "I spent some time with the diagram today to let my spirits ruminate. Decided to put it under my pillow to prompt a dream with it tonight. I don't think I got very far just yet, however I am sharing my work in progress notes so that you may eliminate choices and hypothesis. My spirits don’t quite agree. One of them says portal or "combination of them all.” referring to the implied numbers of adding up the bigger circles and the smaller circles. I may need to spend more time with this. The ONLY thing clear to me about what the spirit is telling you is that there is dimension to the concept. (Repetition can stand for sound or depth) I have read scientific articles of mathematicians getting algorithms and numbers to mirror what is out there in space / the universe, but I myself have no experience with numbers. User wrote: "The being told me "meet me here." I tried asking where, perhaps that is what it is trying to show me, it's realm in numbers, or likeyou said, maybe a key... I will try to contact it again tonight (it is usually around... i find it picking up my hand quickly when I leave my hand passively sitting with a pen and paper) but I think the communication problem is due to the world difference, perhaps which is why it told me to meet it there." I suggested we make a thread for the quest. I volunteered to post it. Please be gentle. I can only take credit for what my spirits offer to the table, which so far has been helpful to me but might not be what helps crack the case. If you don't agree with the thread, I ask that you are respectful with your reasons why there is something incorrect. Educate us. We don't have all the facts, just a goal to figure out. Just now saw this topic and am in a big hurry out the door. I did not have time to read this slowly to even know what is being said....but when I looked at the drawing I instantly knew it was a location out in the universe. I know not intricate details of the zodiac but the number 13 was interesting in that fact. I will have to sit down in my lounge chair and close eyes to see what, and who I can pick up on. thanks for the topic and exercise. Later that day is when I started automatic writing. I suddenly felt the urge to just let my hand be controlled and then I was surprised when something actually did occur (which I have posted in another thread, and which is further detailed here). I have been trying to contact it tonight, but it keeps repeating the same thing: "My 8." Here is the best I could make the image on the computer. 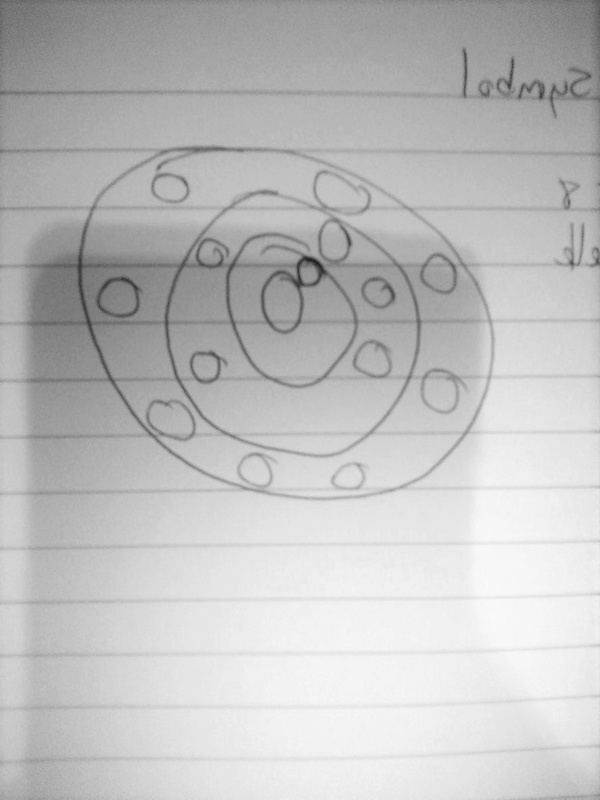 I differed the color of the smaller circles for a clearer image of where the circles were placed and to show the larger v. smaller circles. Just returned but I was thinking about this while I was on the road. I remember the part regarding some higher being trying to contact a lower being (human). I never put too much focus on that as the higher being coming from a higher dimension can always contact us and knows how to make contact. If we are the issue and cannot translate it, then the being just moves on to another that is capable of receiving and understanding...so it is up to the human being to study and learn to connect to the process. from the first view I saw of the diagram I was seeing the Tarot card the Magican... I turned that 8 sideways and I have always seen it relate to the term...as above, so below. The communication is open both ways as how I am seeing it and .... I cannot tell you how I see that...I just say I see it. Thanks for the advice Maxx, I've been working at it. I have to take a tarot card and hold it up and view it as if I was walking into that picture and then walking around that scene. Asking questions to anyone that is there, whether people or animals. I remain silent until that being that is inside that picture tells me what I asked. You may think the process is a little like the old movie named Roger Rabbit. Half cartoon and half human interact. Use the process the same way. I am not saying the same card would be in that scene for everyone but it is for me. one can look at a party where many people are there and each personality is different and they each have something different to say.....It is the same party in that big room, but goodness, are there so many stories and each one is different. The being that comes through to you might have a different story to tell you than the one it would tell to me. So this is how one thing can have so many ways to look at it. How far is My 8 from Maat? Maxx, your teachings come at the exact moment in time when I needed them. I have been reading about similar processes to the one you describe. I am going to try that. I will share the experience when it happens. The vibes that I get from this feel like something astronomical, relating to outer space. Besides approaching the drawing as some actual representation of a different stellar system have you considered for the symbol to be a channeled spirit sigil? Like a key that allows you to travel to the spirit's native realm with your mind and energy, maybe through deep meditation or ritual. This is just a very rough idea, I can be completely off the point here. Maxx wrote: from the first view I saw of the diagram I was seeing the Tarot card the Magican... I turned that 8 sideways and I have always seen it relate to the term...as above, so below. The communication is open both ways as how I am seeing it and .... I cannot tell you how I see that...I just say I see it. I play more with the letter of The Fool's Thoth Tarot. Both have 4 circles and within the circles we coins representing the Zodiac, in Asetianism the zodiac is the Goddess Maat. In all case, your interpretation makes me very interested, Because the tree of life, we have the Sephiroth Chokmah representing Wisdom, and is described exactly by Zodiac. Another detail that makes things more complex, The Empress has a belt with 12 signs around his waist, and curiously unites the path of Wisdom to Understanding, and even now these are the two pillars of Asetian teachings. Jonathan and kalb, that is very interesting. Do you see where you both are receiving and picking up basically the same over all picture where on the surface you both sound like you are saying different things, but they are really the same. There is a great connection between all three of us and what we are saying. Before I saw this posting, I woke this morning and the very first thought I had was that what I just viewed in my dream was group of people there at the dinner. They were all there but those around me were not aware of what was actually meant inside the dream except for the four of us with the private meaning and the emotions that were reflected from this interaction. This dream applied to other people I am dealing with in another way as well as what is taking place here inside this forum. I find this exercise is a means of teaching many people on many levels of understanding. Jonathan is correct in what he wrote as well as kalb is correct in what he wrote. Mine connects with those as well....and now I bet we can see the same element surface in what Leelahel will add to this with the tarot connection she has. Heruset can see and gain first-hand experience on how to connect with the method he feels he wants to work in the future connecting with higher intelligence. This is all rather fascinating. The Grandmother symbol and the color green does have a way of entering this topic as well. I failed to mention the connection with Thoth and Maat and balance and wisdom that kalb mentioned and I meant to do that and missed it. This was a great interaction to read. Everyone brings great experience and thought-provoking additions to the table. I hope this provides Heruset with the next step in this journey! I, myself have learned a lot reading and am attentive to see where this may go. Thank you everybody for lending your wisdom! I had a dream about the numbers and symbol last night and it was something meaningful, but upon waking it was forgotten... I am going to try meditation with the symbol and see where I can get. All the responses are very thought-stimulating and it is interesting how the symbol connected everyone's consciousness participating here as well as how the symbols in each of our consciousness connects to the symbols of another's. Jonathan, I was thinking it could be both a symbol to channel the being through meditation/ritual, and an actual doorway to enter the way Maxx described. Maxx wrote: Jonathan and kalb, that is very interesting. Do you see where you both are receiving and picking up basically the same over all picture where on the surface you both sound like you are saying different things, but they are really the same. There is a great connection between all three of us and what we are saying. I can see the meaning in what you're saying and really agree with that as it's fascinating how apparently different approaches actually connect with valid threads to the experienced occultist. Good stuff. When contacting the entity tonight, I was having difficulties in communication as usual. A few things to note: they mentioned "my creator." However, this time I tried a different method of understanding it... As most of what it says is Melelelelel etc... Normally, I do not think with numbers, and I don't know anything about them but basic mathematical things you learn at school. I figure this is because of the number 8 and the mathematical symbol, so I went on a search for the numerology of the word EL. What I found was that the gematria value of EL is 31. In gematria, one method is called the Integral reduced value. In this, the value is 4, as you continuously add together the digits until you reach one digit. 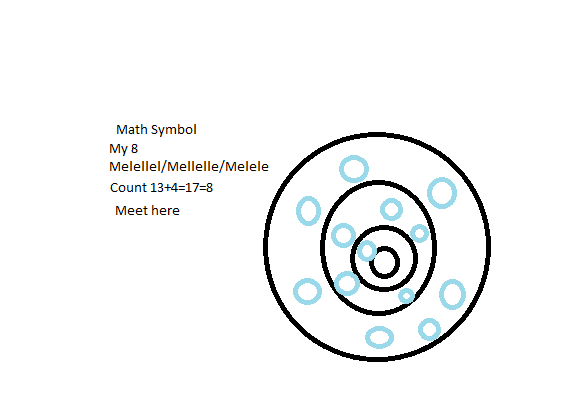 Mellelle, or rightfully, Melel, was trying to communicate mathematically the Me el el, or Me 8 (Me 4+4). Not sure exactly what it means yet. However, when I came across another site, I found the gematria for the tetragrammaton. In normal gematria, it's value is equal to 26. This equals 26. However, there is another method of gematria in which each value over 9 is reduced to single digit number, then the total is added. In this case, the value is 17. When referring to Integral Reduced Gematria (apparently mispar katan mispari in Hebrew), it doesn't matter if you start originally with the regular values or reduced values of the letters, as it will continously be reduced to one digit. would both add their digits up to 8. When written together, MEL is equivalent to 71 in ordinal gematria. (M-40 E-1 L-30) Reduced, this is equivalent to 8. Just thinking outside of the box and putting another idea on the table. Shuffle a deck of Tarot cards and use the drawing as mapping for a spread. I’ve had spirits and guides teaching me interesting spread layouts in similar processes. The difficulty is uncovering the meaning for each position in the spread but the process of discovery has always been tied to learning something new. I have been avoiding the tarot for contact and divination until I grasp enough meaning of the cards. I have a basic idea of Tarot. I haven't dived fully in due to other studies. I will try your method though, since I have been in contact with this being a few times now already. However: a lot of what I received was from my unconscious mind, most of it was nonsensical and rarely was it influenced from outside of my own psyche. Don't be fooled by your unconscious. If you are not deeply healed psychologically then you will not have great success. If you think it is your own self, it probably is. If you think it is not, it still probably (but not necessarily) is. Just to throw in my 2c (I may be way off but sometimes a different angle can open up new pathways). All these 8's and the way the picture looks like a solar system of some sort could make the 8 = infinity sign (there isn't and 8 on it's side on my keyboard to my knowledge which is shame). If the picture could be to depicting some celestial bodies, it is in a place where up, down, left and right are debatable (like the idea behind the 'chaos star' I believe). So the 8 could be viewed from any direction (much like the image itself), which in itself could be a distorted hoop being viewed from the side (shaped much like a saddle) when you start to think in 3 dimensions. The 7 of course has the divine connotations and a while ago there was talk about a 13th zodiac sign (the details on this are hazy to me as I pretty much glanced over it at the time and didn't stop to investigate). It could be a map, the numbers co-ordinates and the letters could be roman numerals or have a meaning in a different tongue. It's hard to say. It also depends on who/what is trying to communicate with you. Maths (at least here) is as close to a universal language as we have. As long as we stay out of quantum that is, then it just gets complicated. If communication goes both ways try sending a few simple Mathematical equations to see if your 'reading from the same book'. If they exist where 2 + 2 = 5 (1984 aside) clearing up the differences could make things easier. If they really want to pass something along they'll be able to walk you through step by step, they can't expect corporeal beings to jump from the equivalent of high school mathematics into advanced Quantum mechanics (with possibly differing mathematical laws to boot! ).